The Rebel Sweetheart. : Spotlight | Etude House Rosy Tint Lips. Now if you're following me on Instagram, you may recall that I received some lovely Christmas gifts from Etude House Philippines. I'm now going through the goodies one by one, and the product that I decided to try first is the Rosy Tint Lips - Etude House's new line of lip products which was released last Fall. I've been eyeing this baby long before they reached Philippine shores, and here it is finally! The box itself is a work of art. This is one of the many things that I love about Etude House (and Korean makeup brands in general) - they have a way of making you fall in love with their product/s from the packaging alone. And this one is no exception. Because of the plastic squeeze tube packaging, I won't be surprised if you'd mistake this for a lip gloss at first glance. But no, they're actually lip stains - highly pigmented, creamy texture, and with a lovely matte finish. If you're familiar with NYX Soft Matte Lip Creams, the texture and the 'feel' is pretty much the same. To use, simply squeeze the tube until you get the product flowing into the sponge. It's not as simple as it sounds though, as the tube is a bit dense and hard. Almost too hard, in my opinion. The material they used for the tube is not exactly the 'squeezable' kind. But once you get the product on the sponge, the actual application is easy-breezy. This product glides on my lips like a dream. Shade number 1, Before Blossom. There are eight shades in the Rosy Tint Lips collection. What I have here is shade number 1 - otherwise known as Before Blossom - a warm shade of red that's very wearable and not as 'loud' and shocking as the swatch appears to be. The color is buildable, and lasts about four to five hours without eating or drinking. Before Blossom on my lips. This product has a faint rose scent which I particularly like. I don't think this will be an issue for those who prefer unscented lip products as the rose scent is hardly noticeable. This lip stain's formula is lightweight and non-drying, despite the matte finish. Oh, and the price? They sell for Php 478 (around $10) a pop at Etude House branches nationwide. - Doesn't feel dry on the lips. - Several shades to choose from. - Perfect for gradient lips. - Can also be used as a cheek tint. Missha Under Eye Brightener, Etude House Any Cushion. The Face Shop Lovely Me: EX Design My Eyebrow. CHEEKS: Skin Food Sugar Cookie Blusher in Bebe Pink. 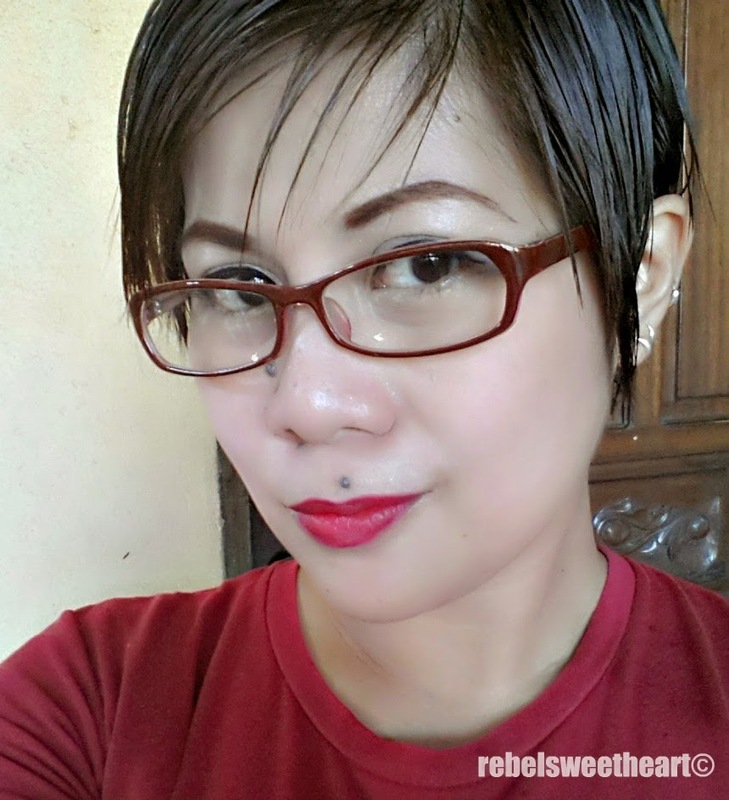 LIPS: Etude House Rosy Tint Lips in Before Blossom. I'm not a huge fan of Etude House products but this one seems promising. The pigmentation is really something! Does it fade like Tonymoly's lip stain, becoming less vibrant shortly after application? Wow that's very tinted I wonder how the other shades are I want! That's very tinted indeed I want one! I wknder if there are other shades na bagay sa morena like me! Hi Rowena! It does fade a bit, pero maganda yung pagka-fade nya. Parang gradient lips ang effect haha! lovely lippy shade! especially come spring...am already on the lookout for 'em. Never heard of these products but I really like the color. I'll have to check it out. Super bagay sayo ng shade! :D I love the velvety rose petal texture of this one too. I love that color. Nice and dramatic! I would totally wear it! I have never used an Korean brands of makeup before. I need to update my makeup, for sure, though. The box is beautiful...it would have drawn me in right away if I had seen it in a store. A very unique applicator-- I like the color--The photo of you is stunning! What a pretty lip tint -- and it looks great on you! You are so right about the packaging, too. The first thing that captured my attention was how bright and beautiful the box is. I love when companies pay attention to not just the product, but how they are presenting it to people. I love the packaging of the Etude House! Hehe. So girly! Wow! That's really bright! But of course you can pull it off. Never heard of Etude House though. I've been wanting to try these ever since they first came out! I want at least a few shades. The one you got is one of the ones I like :) I love formulas like this because they apply really nicely for dry lips like me and then eventually get a matte finish which I also prefer for my lip products. Looks like a fun color to ump up a Saturday morning sweater and jeans day!! Has a nice pop on you. I don't even use the sponge applicator. Lip brush na lang agad. The sponge-tip isn't the most accurate, so I'm prone to going beyond the lip line.